I am a great believer in the effort to glory ratio. Low effort, high glory and impressing people is my signature way to cook. 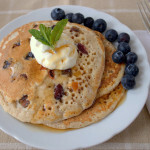 We do like starting the day to a nice breakfast, especially at the weekend, and what could be nicer than eating American style pancakes, washed down with coffee whilst reading the paper? Most people have both milk and eggs in, so these are very easy to make at a moments notice. Used packet mixed fruit, or make your own mix up – chopped dried apricots and cranberries look pretty. 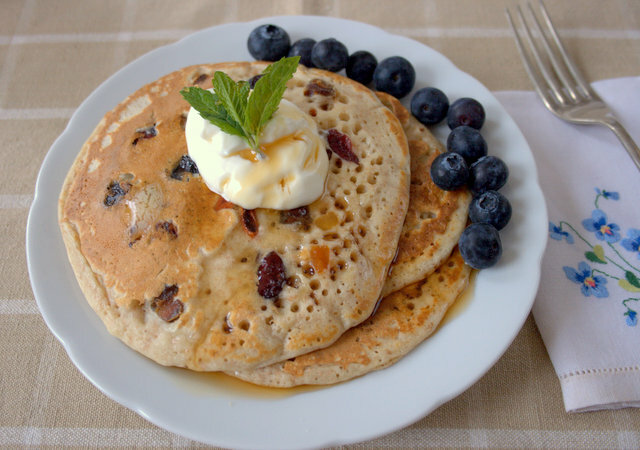 If you try this Recipe: Jewelled American Pancakes please tag #FussFreeFlavours on Instagram or Twitter. It is amazing for me when for me when you make one of my recipes and I really do love to see them. You can also share it on my Facebook page. Please pin this recipe to Pinterest too! Thanks for reading Fuss Free Flavours! Mix together flour, baking powder, eggs and milk. Do not over beat, as this will result in tougher pancakes. Add in the dried fruit mix gently. Heat a little of the butter in a frying pan over a medium heat, and cook the pancakes in small batches. Turn once, when the bubbles rise to the surface. Keep warm in the oven whilst you cook the rest, or eat straight from the pan with butter and maple syrup. Serve with a side of fresh berries and thick creamy yoghurt.